Eversend is an amazing company based out of France. They are building the future of the Banking world for Africa. We are honored to be working with them as a service provider. Africa has adopted mobile financial inclusion faster than any other part of the world. We saw the birth of MPESA in 2007 and since then a new Era for the continent was born. We are seeing Africa relying more on mobile money and other mobile technologies for peer to peer transfers, for loans, for insurance and so many other services that to the rest of the world would have been provided by traditional banks. In an interview with the Eversend CEO; Mr Stone Atwine, the company intends to start by focusing on services that banks do poorly like cross boarder transactions and payments. The payments and remittance game is mostly about partnerships. 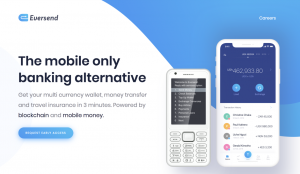 Eversend Partnered with DusuPay and is using dusupay’s payment rails to collect and disburse funds to both mobile money and Banks.